We are excited to be launching AUSSIE RULES THE WORLD! After reading a small article in the Sydney Morning Herald about Swan’s superstar Brett Kirk becoming the AFL International Ambassador, we thought his journey would make a great film for both footy fans and travelers. I grew up in Tasmania and have been a dedicated Tigers fan since I was 10. My mum has been a St Kilda supporter for 58 years and now my son is a passionate Swans’ supporter. Stay tuned on Facebook/Twitter and sign up for our newsletter to hear more about the film! THE language of handballs, torpedo kicks, marks and inside-50s has long been foreign to the rugby league-obsessed citizens of Sydney. 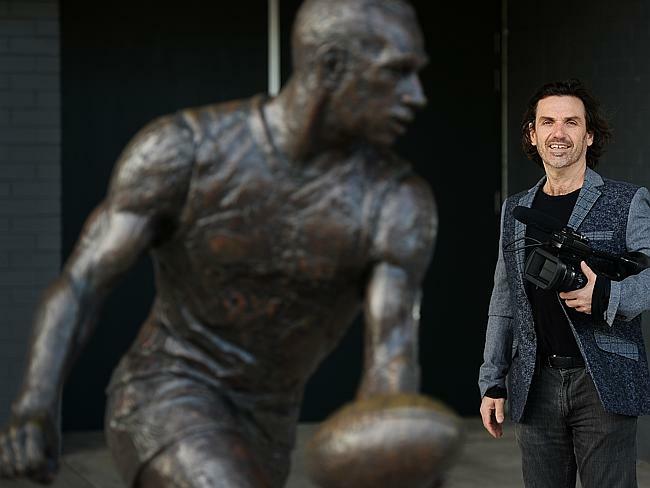 So when Tamarama filmmaker Michael McIntyre decided to embark on a global journey spruiking Aussie Rules, he wasn’t sure what to expect. McIntyre, a Richmond Tigers boy in an eastern suburbs world, accompanied former Sydney Swan Brett Kirk (left) over the year of his role as AFL international ambassador. The result, Aussie Rules the World, is an at times strange and often bizarre snapshot of the inroads AFL has made in territories such as South Africa, Denmark, the US and beyond. “I mean, in Denmark, they’ve got purpose-built Aussie Rules grounds,” McIntyre said. McIntyre credits technology with breaking down international borders. “There’s no question that with the internet and social media the sport has become more accessible,” he said. "We're now living in a country where half the people were either born overseas or have a parent who was born overseas. So this is a rapidly changing country and Australian football is going to have to find its way in that changing world. "